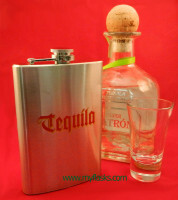 Treat yourself with a nice, small drink using this flask wrapped in faux leather. Container features screw-down cap and polished finish. Measures 3-3/4” x 5-3/4” x 7/8”. Limited lifetime warranty. White box.